If you own a home and have a growing family chances are you’ve contemplated the common homeowner question on whether or not you should build a home addition or sell and buy a larger home. It’s an age old question that takes a lot of thought and consideration before arriving at a decision. There are home addition pros and cons that you should seriously consider before making a final decision. 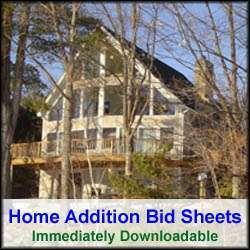 Summarized below is a list of the major home addition advantages and disadvantages. Choosing to build a home addition enables you to keep your family in the same home and neighborhood. This can provide both financial and personal lifestyle benefits. Often building a home addition is less expensive than selling your existing home and moving into another larger one. With building a home addition there are no real estate brokerage costs and state transfer taxes to contend with. Likewise, if you like the schools that your kids attend, and you have friends in the neighborhood, staying put and building a home addition prevents upheaval in the family life. Building a home addition also allows you to build just the right amount of additional living space for your family’s needs. Moreover, you can customize the home addition design to your personal aesthetic tastes. In addition, you can better control the costs of a home addition project. For example, you could decide to build the home addition and have the family move into it while holding off completing small, yet expensive parts of the project. For example, flooring and trim work could be delayed until your budget could support the additional costs. Similarly, when building a home addition you can choose to put in some of your own sweat equity to save on construction costs. Building a home addition can be disruptive on the family. For example you have contractors running through your home throughout the day and there is dirt and dust that inevitably gets tracked into the rest of the home. Moreover there can be temporary disruptions of services and areas in the home. For example, if the home addition involves building a larger or new kitchen, the existing kitchen could be temporarily placed out of commission. If your home addition plans involve putting a second story on the home, then the family may need to vacate the home temporarily and some home furnishings may need to be placed into storage. Building a home addition doesn’t always mean that there will be cost savings relative to buying a larger home, or increased value to your home. Depending on real estate market conditions and the size and style of your home addition, you may not recover the cost of building the addition, particularly if you sell your home shortly after putting on the home addition. Note that it is important to do a real estate market analysis of your neighborhood when contemplating a home addition project. The market analysis will help you budget and size your home addition properly so that you don’t end up building more home than what the neighborhood real estate market value could support. 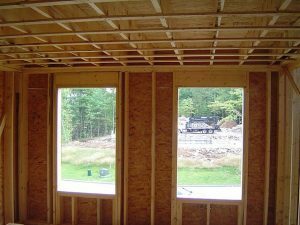 Building a home addition takes space, unless you are building a second story addition. Consequently you need to be willing to accept a smaller yard when building a home addition. You will also need to confirm with your local building inspector what setbacks and restrictions there might be on building a home addition on your property. Lastly, building a home addition can cost more than you anticipate if you don’t plan properly. The last thing you want to end up happening is making on-the-fly change orders to the design during the construction of the home addition. The contractors will charge you dearly for the change orders. Fill out our 3-5 minute quick and easy form, and receive a free price quote on a house addition from one of our pre-screened and licensed home addition contractors. 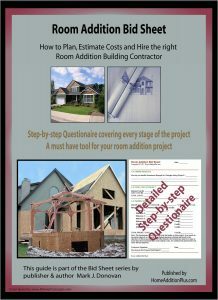 This process is free and there is no obligation to continue once you receive your house addition price estimate.